Ever found a website or blog with these captions “Free eBook online’ or ‘Fre stories online?’ Of course, you haven’t. Free stories of depth in terms of complete entertainment, enjoyment and realism are very hard to come by. There is always a catch as you must have to pay because writing stories, like building a house, is not easy. The aim of this blog is to try to crack that payment barrier and bring you wonderful stories by a little-known author EZE KING EKE, all for free. Do invite your friends and social media contacts by sharing posts on this website as much as possible so the popularity might be a reward for the author’s labors. It is the only way you stand a chance of reading wonderful stories and more for free here. Below are some selections of these stories, each of which is yet an unwritten book that will unfold here on this blog live! Updates every 2 days or so. Each is unique as is the author’s writing style. 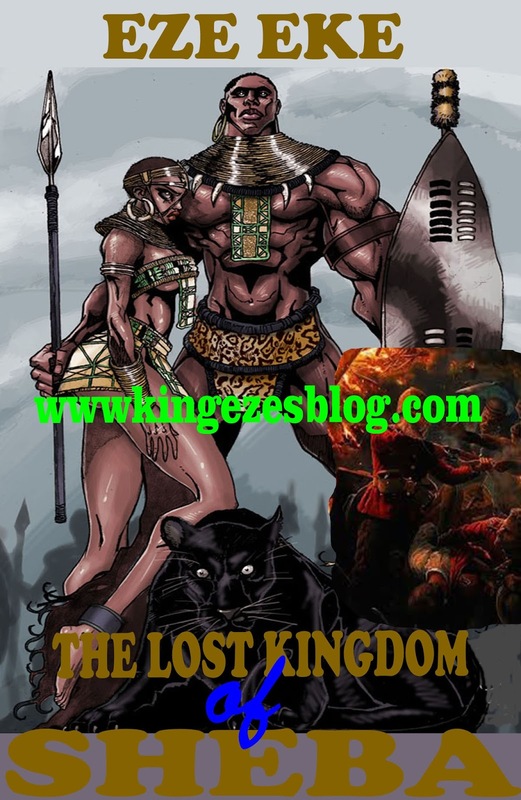 Eze Eke is at what he knows how to do best….writing stories. In whichever part of the world you are, welcome to KIingreads. One out of these 4 stories is already unfolding here, the rest will come in time. There will be a poll carried out in our facebook group to pick the story to break here on the blog when the present one runs out. The year is 1851 and British control of West Africa is beginning to waken. The inhabitants of a little kingdom in the heavily forested interior of eastern Nigeria are thrown into shock when a naked white woman comes walking right out of the river in broad daylight and right into the evil forest where no human being could venture without being struck dead by the gods. The woman established a temple as a goddess right in the large cave shrine of the powerful Uri god, protector of the forest and the high-priest of the demi-god becomes her high priest. Her followers and worshipers grew from there. Her faithful worshiped her like slaves, sacrificing their children and loved ones to her. while ill fortune befell those who didn’t come to her. The king and his chiefs, having tried scores of powerful witch doctors and other gods for help to no avail, turned to a local prophet of the living God in desperation. The prophet arrived at the village with his assistants and went straight into the evil forest like an avenging angel. He killed the goddess right in her shrine, in the congregation of her worshipers, the seven assistants stabbing her to death during a festival before them. As she died, ‘the woman goddess screamed a promise that she would return even more powerful and bring terrible vengeance to the descendants of all those who killed her. The woman is reborn after a bizarre ritual by some devil worshipers in the United States and her vengeance begins right away. As a glorious beauty in her twenties, she is worshiped by over a thousand people including a billionaire who supplied her with all the riches she needed in life until he is drained financially, physically and mentally. She isolates and kills 16 descendants of her previous murderers and then moves to Europe and Africa to continue the job. In Nigeria, she met her match in a direct descendant of the prophet, a prophet in his own right with strange supernatural powers and the war begins again. After the death of her mother, Marlene returns to her country mansion home from the city for the burial. It was supposed to last just a few days, and then the house would be up for sale. Marlene and her sister, Sara, would share the money, and that would be that about the old cold house none of them wanted. On that first night alone, Marlene is awakened in the dead of night by strange sounds which lead her to her mother’s long-kept secret …. a secret door which leads down to a large underground room below the house. There, Marlene is shocked to find several glass coffins with perfectly preserved life-like corpses in them and so many voodoo charms. She finds her father’s body is there and so is that of her grandmother and others she did not even know., She even found the corpse of her mother who had been buried in the cemetery only the day before, but one thing stands out, a coffin in the far corner of the large room. It was so old, the inscriptions on it were in an ancient language she couldn’t even understand with all her knowledge and degree in history. As Marlene touches the coffin, cleaning off the dust to read the engraved inscriptions better, it exploded in a ball of fire and she covered from it as a terrible black smoke burst forth and began to take shape….the shape of a demon. Released from its 2000-year imprisonment, the daemon attacks the descendant of its captors in fury. Just as it’s set to take her life, one of the corpses came fully alive with the taste of a drop of her blood, split on it during the attack. The corpse, now a rejuvenated old woman, attacked the demon with incredible supernatural powers and it fled before her. Marlene’s great-great-grandmother had only 5 days to live in the world of man and she spent two of them nursing her descendant back to health. She teaches Marlene the secrets of her origins. Marlene is the last in a long line of white witches whose ancient duty it was to keep the terrible demon prisoner. They had been successful for 2000 years until a new coven of black witches led by a powerful male witch began to worship the ancient demon again which increased its power to the point of setting it free in the lapse between the death of Marlene’s mother and Marlene initiation into the order to fill the vacuum. All of this was made possible because one of those black witches, pretending to be in love with her, deceived her into not heeding her mother’s last calls before death. Marlene now had the task of building a new prison for the demon, catching and imprisoning it again. before its spawn filled the earth to its destruction. But first, she would have to unlock her great powers as a Witch. …the 53rd and most powerful of the line. She would have to destroy the new coven of black witches alone. It is the year 1826 and slavery is booming. On a large sugar plantation in Louisiana USA, an old but powerfully built male slave kills a sadistic white slave-driver for beating a helpless slave woman to death. The black woman’s murder goes unpunished but the white man’s murder must be punished with death, that is the law. While the old man was set to be executed, word got to a British-American adventure about a strange ivory pendant found around the old man’s neck. Mark Lawson hurries down to the plantation to see for himself and discovers that the strange ornament is actually the shield of the ancient royal house of Sheba, descendants of the queen who visited King Solomon of Israel from the interiors of Africa with so much gold and precious stones in riches as a gift. It was a myth come alive but most importantly he had seen that shield before, carved on a human skin….the skin of a little boy found wandering aimlessly in the plains north of the Limpopo river in Dutch occupied South Africa several years before. Questioning the hardened old man wasn’t easy but telling of the boy helped and Lawson discovers he is part of a family who are hereditary guards of the ancient royal house of Sheba. With new hopes of discovering wealth beyond his dreams, Lawson settles matters with the plantation owner with a beefy bribe and heads off for England with the slave where he gets proper travel papers and then off to South Africa to visit an old friend who had the ‘boy’ as a personal servant. The ‘boy’ was now a big giant of a man and at the sight of the birthmark on the skin of his ribs, the hardened old man went down on hands and knees and worshiped him as king of Sheba or Shebawa as the native tongue had it. In all, four white men, and six Dutch soldiers set off north into the unexplored interiors of virgin Africa, first by ship up the eastern coast and then by foot, matching for days deep in. Their aim? Finding the lost kingdom of Sheba and the riches therein. Their journey took them beyond impregnable mountains and into a strange land where no white man had set foot before. 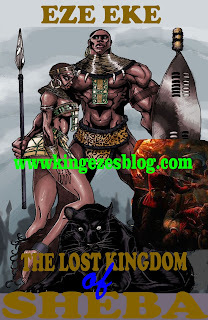 Finding the hidden valley where the lost kingdom was located was as good as impossible in the vast new lands without the old man who had died along the way but battling the tyrant Zulu king and his vast armies who had spread their tentacles all over the region was war! An empire of crime ruled by a very attractive and ruthless woman. Madam Augustina Benson aka Madam T, is a stupendously rich and powerful woman, head of a criminal empire with lofty connections all over Nigeria and beyond. Second to her and just as ruthless, is her adopted daughter, the extremely lovely Helen who she rescued off the streets of Logos as a sick and homeless young girl, an orphan, and then gave new life. Helen has been carefully groomed and her heart is as black as she is beautiful. With Helen, her nephews and her Lawyer son, Madam T rules her empire until the problem of a smart Private Detective presents itself in the worst way. Following the kidnap of a billionaire’s daughter, all hell breaks and several security agencies come into play. None is a match for the sophisticated Black Axe Crime family but that private detective is different, he was an ex-DSS agent. Also different is the kidnapped girl who has two of her captors, including Madam T’s nephew in love with her. The stories above will be coming soon. One will be free on this blog but the other will be paid works.